Yar! Me book’s been pirated! A spot of late-night Googling this week revealed that Unscrupulous Persons are offering my book (or parts of it “for review”) as an ebook or downloadable PDF. Went to bed feeling a bit sick about it. This probably happens to lots of authors, and some people are okay about it, saying It gets my book out there/It’s good advertising (not me). There’s also an argument that It’s not really a lost sale because the person wouldn’t buy it anyway, but the more normal or accepted book piracy becomes, the less there’s an incentive for people to pay for them, so eventually readers who buy books stop buying them. It also leads to a decline in the perceived value of a book. Piracy has repercussions on not just authors (and their publishing contracts), but publishers, distributors, retailers, everyone who has a job in those three industries, and ultimately readers. The sites in question have an almost legitimate-looking first page. They may ask you to sign up or register and pay in order to download the PDF. Downloading may invite a virus onto your computer or unauthorized payments from your account. However, it may just be a scam and they don’t really have anything; I suspect this might be the case but I daren’t click on anything to find out. The Dressmaker’s Companion is only available as a printed book. It hasn’t been published as an ebook for a few reasons: apart from making piracy harder, ebooks generally aren’t suited to heavily illustrated books (like mine) because you can’t tell the device it will be viewed on (the ultimate, though, would be to have an ebook with embedded videos to show sewing techniques). 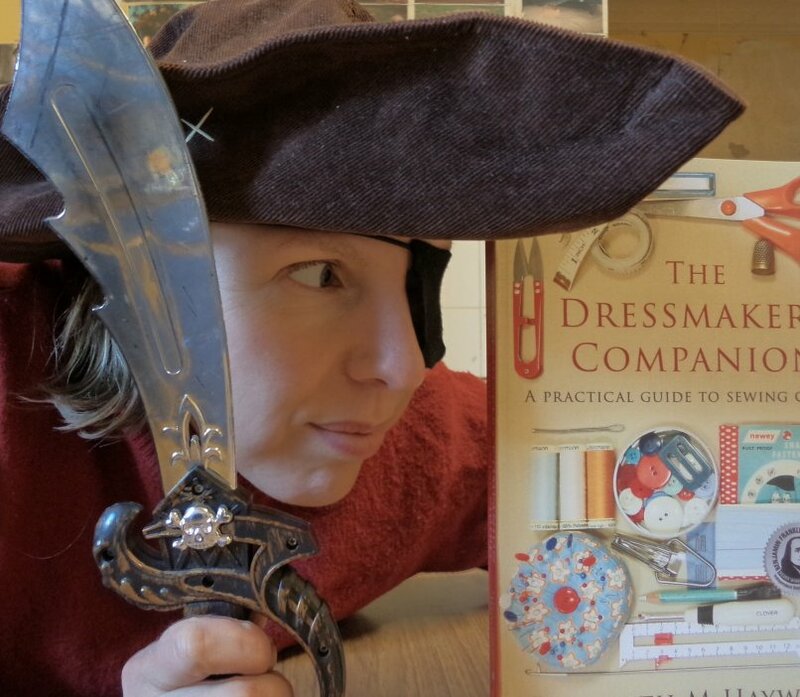 Maybe you’re thinking of buying The Dressmaker’s Companion and you’d like to flip through a copy first. Don’t be tempted to download a free sample! You could see if your local library has it, and if they don’t, why not ask your librarian to purchase a copy for the library? Then you could be the first to borrow it, realize that you must own a copy, and buy one! I recommend you buy the book and don’t be tempted to download a free or electronic copy that is pirated. It’s a breach of copyright and dishonest! I am so sad to hear about this, Liz. People can be very gullible about copyright and I will make sure I mention the need to obey the law to protect copyright in my next newsletter to my students. Piracy is a service problem. The best way to stop people pirating PDFs is to sell them PDFs. I was at a D&D game earlier this year and every person there owned a hardcover copy of the player’s manual. Everyone except me also had tablets with the PDF of it, because that was surprisingly easier to use. It’s the same size as your book, and full of pictures and large complex tables, but zooming is a simple pinch gesture so the screen size doesn’t matter. You can scroll to any page with ease and search for any text. You can add notes and bookmarks. There are no delivery costs, you can get it instantly, and you can literally carry a whole library around in your bag. It takes up less desk space than the physical version, it’s smaller and lighter, and can be used with one hand. Maybe people would like to reference your book with one hand while holding together a seam with the other? In any case, a lot of people prefer PDFs so maybe you could sell them what they want to use instead of what you think they should use. It also gives you quality control. Piracy evaporates when people have convenient access to pay for what they want. Valve Software released the Steam platform for games and piracy became a non-issue for them. Australia was ranked #1 for TV piracy before Netflix, and now we’ve dropped to #16. Napster for free music is gone, people pay to use Spotify now. Not selling your book as a PDF doesn’t reduce piracy, it increases it. Once you’ve done that, it’s fairly effective to have the remaining pirated copies removed by issuing DMCA takedown requests (or the regional equivalent) against web sites hosting the files. There are web sites that give step-by-step instructions on how to do this, just google “DMCA takedown request”. Thanks Tom. I just remembered some knitting books I have that offer a free pdf of the book when you buy the printed one (there’s a sticker on the inside cover with a code on it); will look into it. Cheers! I’m really shocked. The cheek of these criminals seems to know no bounds! With a film-maker, designer and musician in the family (all trying hard to get ahead! ), we’re very aware of these piracy problems and their impacts. I’m very sorry this has happened to you! Have you set up a google alert for your book, to keep track of any misuse of your IP? I think it’s pretty commonplace with books, Shayne. I hear stories of fiction writers who loose publishing contracts with their next book because the first one got pirated and it affected sales, so I am fortunate not to be in that situation.